It was indeed painful as Chief Tunde Akinola, now of blessed memory died from the complications of high blood pressure. The wife said there was no indication to that effect until he started breathing hard with high palpitation that fateful night. He was rushed to a nearby hospital where he was diagnosed of high blood pressure. His blood pressure was 205/120. Yes no previous alarm or indication to that effect. After the diagnosis, he was given some synthetic drugs and was put on bed rest for two days. However because of his schedule he had to get discharged to attend to his business. It was at home on that night of discharge that Chief Tunde Akinola had a stroke and died of heart failure. This is the story of high blood pressure. It is a silent killer. Most times it never announces that death is at the door. It is alarming the rate at which patients of high blood pressure die these days. Our blood pressure keeps shooting up day by day. High blood pressure which is also called hypertension is when the blood pressure is at the level of 140/90 or higher. Reasons for the increase are multifarious? This ranges from bad eating and drinking habits to lifestyles that does not indicate that one loves to live long. Being a silent killer therefore the first healing process from the disease is to identify some of the symptoms of high blood pressure. Beyond the blood pressure readings, the symptoms include severe headaches, shortness of breath, insomnia, chest pain, nausea and vomiting, blurred vision, fatigue and dizziness. Similarly you may be likely to develop high blood pressure if you engage in smoking, overweight or obese, lack of physical activity, too much salt in the diet, too much alcohol consumption, stress, old age, genetics, family history of high blood pressure and chronic kidney disease. High blood pressure leads to weakening of blood vessels, which lead to rupture and bleeding, thus leading to a stroke. The other parts of the brain may not receive the blood supply causing the brain cells to die. High blood pressure can also clot the arteries leading to your brain. High blood pressure may not allow blood to flow freely through the arteries to the heart. It is responsible for heart-muscle fatigue. Thus, the heart works with lesser efficiency and does not pump enough blood as per the needs of the body. Such a strained heart can eventually fail. High blood pressure can damage the tiny blood vessels within the kidney. This reduces the filtering of fluids and waste from the body. It may even lead to kidney failure. The above mentioned harmful wastes keep on accumulating in the body, forcing you to go for a dialysis on a regular basis. High blood pressure introduces stiffness in the arteries that carry blood to your heart and kidney. The organs have to work harder to make the flow smooth. Eyes are extremely sensitive and rise in blood pressure beyond a point is harmful for them. If the blood vessels of the eyes burst, you can even turn blind. Diabetes and high blood pressure are inter-related. High blood pressure complicates diabetes further by making a diabetic patient suffer from diabetic eye or kidney problems. Also, diabetics are prone to suffer from hypertension or high blood pressure. Though devastating, high blood pressure can be treated with home remedies, medication and changes of lifestyle. Regular intake of green tea reduces the blood pressure levels. Due to the healthy and healing effect of green tea, it has become an important natural resource for controlling high blood pressure. Green tea contains lots of anti-oxidants (catechins), which help protect the heart and blood vessels. It is safe to consume two to three cups of green tea on a regular basis. Consuming green tea regulates the pressure in blood and the threats caused due to high blood pressure can also be avoided. Green tea is more effective over systolic blood pressure as compared to the diastolic blood pressure. Systolic blood pressure is related to the blood coming out of your heart. Diastolic blood pressure is the level of blood pressure between two consecutive heart beats. Green tea consumption when combined with regular exercise and a healthy diet can really help to quite an extent in lowering the blood pressure. Beetroot juice is a rich source of nitrate, which converts into nitric oxide. This nitric oxide is a vasodilator and helps in normalizing the flow of blood inside the blood vessels. 500 ml of beetroot juice can significantly bring down the blood pressure, specifically systolic blood pressure by 10mmHg. Drinking 250 ml of beetroot juice everyday can serve as a powerful remedy for controlling high blood pressure. A scientific research further confirmed these facts when 25 individuals of age group 18-64 years were subjected to different quantities of beetroot juice and water. The higher the level of beetroot juice consumed; the lower was the level of blood pressure in an individual. In case of individuals with plain water consumption, the blood pressure was higher than normal. Thus, you can deduce that beetroot juice is a powerful vegetable extract in reducing high blood pressure. Guavas are very rich in fiber, antioxidants and vitamins and are hypoglycemic in nature. Guavas help in maintaining the normal fluid content of blood thus, making blood flow smooth and helping it continue at an optimum pressure. Guavas can help reduce the cholesterol content in the blood. More over its hypoglycemic nature plays a very powerful role in reducing the blood pressure. These days we consume a lot of food that is lacking in fiber. Due to this, they quickly get converted into sugar, and this sugar content obstructs the normal blood flow. High blood pressure is thus caused. The beneficial effects of eating guava before meals, in lowering blood pressure have been further studied in various researches. In one such scientific study, a 100 people were asked to participate. Among them, 50 had guavas before their meals and 50 were given their usual diet. After 13 weeks of this repeated activity, the blood pressure of each individual was recorded. The ones who were consuming guava had an average reduction in blood pressure by eight points. But those who continued to eat normally, had their usual high blood pressure levels, no progress made. AGE protects, as well as enhances the growth of endothelial cells that line the blood vessels. It is also a powerful antioxidant. It performs the action of inhibiting oxidative damage of the endothelium. Stress factors, including smoking, drinking, improper diet and hectic lifestyles can cause a great damage to the endothelium cells. But eating AGE helps to treat them. 25 people were given AGE at a dose of 800 mg/day, for six months continuously. Cholesterol levels and blood pressure were measured on a monthly basis for every individual. AGE treatment resulted in a 5.5 percent decrease in systolic blood pressure and a smaller decrease in diastolic pressure. The researchers found that total cholesterol levels were lowered by an average of six to seven percent. Thus aged garlic extract is one of the simplest ways to get rid of high blood pressure, when taken regularly. Green coffee bean extract is the latest buzz on the health market today and investigations have considerably increased about it. It is very useful in promoting good health, like controlling high blood pressure. Another big advantage of green coffee bean extract is that it is natural and has no side-effects. They are just like green tea in nature and properties. Just like green tea they are rich in anti-oxidants (30%). The anti-oxidants in green coffee beans are chlorogenic acids (CGA). The process of preparation of green coffee bean extracts (GCBE) is exactly like that of black tea. The original green coffee beans are processed from their original state, just as in case of processing of black tea from green tea leaves. As low as 185 mg of green coffee beans can have a significant impact in controlling high blood pressure. A study using green coffee beans was being conducted over a period of one month and with 117 individuals, who were suffering from high blood pressure. The results were in favor of green coffee beans. The greater the dose of green coffee beans, the greater the improvement in the health of the individuals because of the lowering of high blood pressure. The ones who did not consume the green coffee beans continued to suffer from high blood pressure. It is important to note that these are dose-relatedness findings, since these dose-relatedness findings are a clear cut evidence that a studied treatment is actually effective. Blueberry is another fruit which is good to taste as well as good for the health. The use of blueberries in various preparations is gaining immense importance due to the enriching properties of blueberries. Blueberries are rich in polyphenolic anti-oxidants, which are beneficial in avoiding strokes, and may have vaso relaxation effects. Thus the same fruit can serve the dual purpose of repairing your blood vessels (done by polyphenolic antioxidants) as well as relaxing them to promote smoother blood flow. In a scientific research program, rats were subjected to 3% dried and frozen blueberries for over 8 weeks. The results indicate that a mere 3% blueberry diet is capable of delaying the beginning as well as reducing the duration of hypertension to quite an extent. Medication is a powerful method to control high blood pressure. Various medicines marketed under different brands have been used for medication of high blood pressure. There are plenty of medicines in the market to lower the blood pressure. But, they have potential side-effects like: kidney damage, imparting weakness to the limbs, insomnia, skin rashes, increased asthma symptoms etc. 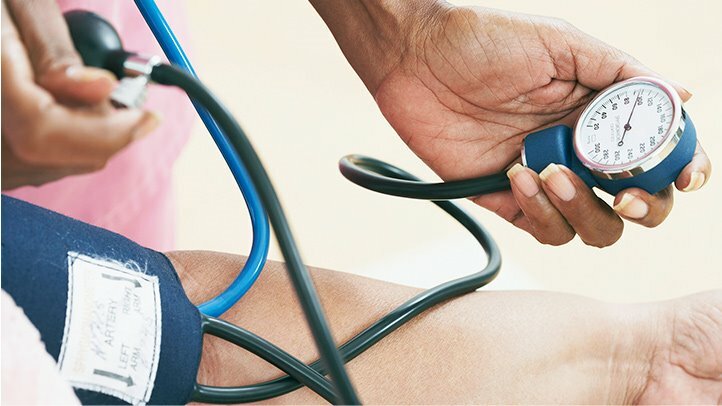 Here, lies the importance of home remedies for treating high blood pressure. The indigenously made medicinal weaponry has no side-effects or additional health hazards, unless someone is allergic to some of the naturally occurring substances. These indigenous weapons can fight and control high blood pressure more effectively than the medicines. They have no side effects and the blood pressure lowering effect of home remedies lasts longer when compared with the usual medicines. The way we live and the habits we have, contribute a lot towards our health. It is high time to admit that the lifestyle, which we have adopted, is one of the top evils in spoiling our health and chief cause of common health problems. We need to identify the wrong practices in our lifestyle and change them or rather eliminate them from our daily routine. Checking BP regularly: BP machines are available at reasonable prices at various medical stores or online. Purchase one for your home. Make it a point to check your BP at regular intervals. Eating a Healthy and Balanced Diet: Cut down the junk from your meals and consume healthy food and a balanced diet. You will notice a significant decrease in your blood pressure levels. Maintaining Proper Weight: This is the toughest practice to implement. Start by eating and drinking right and add physical activity in your life. The Ayodele Shapelyn capsules have helped many people tp lose weight and keep the weight off. You can visit their store @ www.ayodeleherbals.com This will help you maintain your weight. Regular Exercise: Exercising imparts strength to your muscles and helps you maintain proper BMI ratio/weight. All this is beneficial for reducing hypertension. Reduce the Consumption of Salt: Salt is a very important substance. Without it, the most delicious cuisines of all are just rendered unpalatable. For patients with high blood pressure, consumption of salt must be minimal. Excessive salt can cause thickness and stiffness in arteries that can induce strokes and deteriorate the filtering capacity of kidneys. These practical solutions are almost ineffective if one golden therapy for controlling high blood pressure isn’t being followed. This golden therapy is called Happiness. Just relax and follow the remedies with happiness and a positive mood. Thank God for the wonderful life you have, make sure you live happily and tackle all problems peacefully. Perhaps, if Chief Tunde Akintola had known all these, he would have still been alive. Take precaution to avoid the silent killer!! !